"Can I sell my own documents?" Yes, you can! You can also create your own intake questionnaires using Rapidocs and treat the questionnaire as if it were a document for processing through the DirectLaw shopping cart. 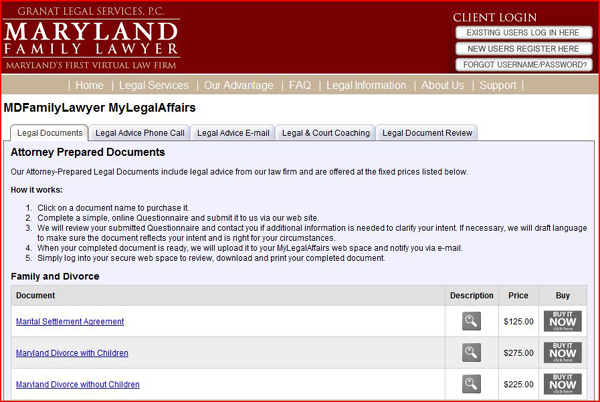 While this option does not have the benefits and efficiencies that our libraries of Rapidocs-based documents offer -- i.e., clients won't immediately access and complete an online Questionnaire that will create their docs behind the scenes -- our open platform offers the flexibility for law firms to easily sell their own documents via the firm's "menu" of available documents. The graphic below illustrates how the "menu" appears on the firm site. Firm obtains from the client the info necessary to prepare the purchase document(s). NOTE: We encourage firms to use the collaborative features of the platform to facilitate this information gathering process. Example: Start a secure communication with the client to provide details on next steps; Upload the firm's own questionnaire or intake form (Word or .pdf format) to the client space; Client returns the completed questionnaire via the upload/file sharing function. Firm uses the info in the completed questionnaire or intake form to prepare the client's document(s). Firm uploads completed document(s); the client is notified and downloads his/her completed document(s) from the client space. If you have a DirectLaw 30-Day Free Trial account, see how this new feature works by simply logging into your free trial -- click here. Go to the Attorney Dashboard, Customize Store tab. Click on the link "Add Non-Rapidocs Documents for Sale" where you can enter your Document Title and Document Description. Additional step-by-step instructions are included. NOTE: Document Usage Fees do not apply to non-Rapidocs documents. 1.You can create an online questionnaire using Rapidocs which is treated just like a document when processed through the DirectLaw shopping cart. A Rapidocs Intake Questionnaire can have help screens and the questions can respond to logical directions. Thus, for example, if the answer to one question means that another group of questions is irrelevant, the other group of questions can be greyed out. You can use Rapidocs validation rules within a Rapidocs Intake Questionnaire. It is easier to create an online intake form using Rapidocs, than it is in html. 2. The answers to the questionnaire are exported and you can use them to import into a desk-top document assembly solution. 3. You can author a Rapidocs Intake Questionnaire using Rapidocs Author, the Rapidocs authoring system, which is included with your DirectLaw subscription. 4. If you need help with automating or creating a Questionnaire, we can do it for you. Our fee for creating a Rapidocs Intake Questionnaire is $75.00 a page. Don't have a free trial account? Click here to sign up.